← I finally got it on her!! It is nearly the end of the month and I just realized I haven’t posted very much. Truth is, it’s been a fairly calm month so far. Nothing has really jumped out where I wanted to tell the world. 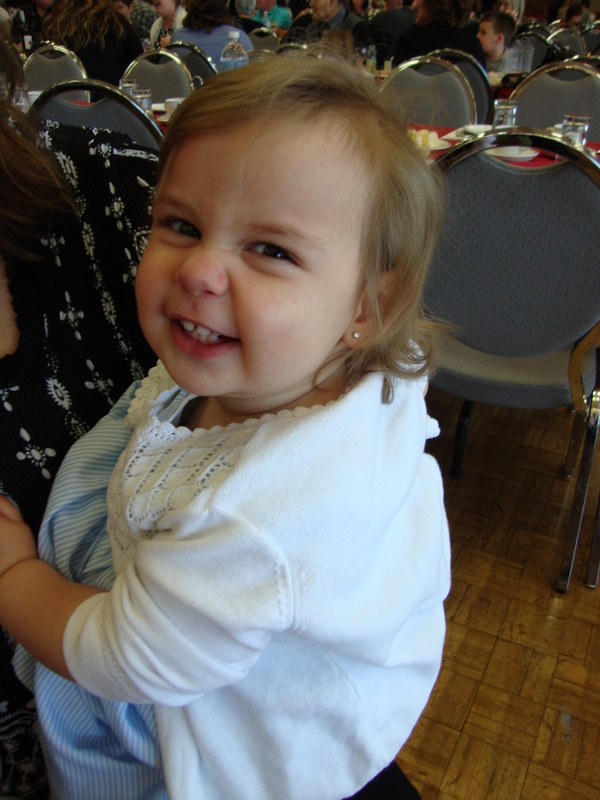 Isabella is still my little monster, I’m still looking for work and I started my course through George Brown. Oh well Mother’s Day was spent at the Caboto Club, we had a buffet and that was nice because my grandmother was able to join us. Isabella started to get a bit fussy so we left earlier than we wanted. I understand that there was this little thing called a recession last year. I understand that the city hit a slump because of the car industry. But I would like to say this, it is time to get off your asses and start paying out what people are worth! I’m getting tired of seeing jobs that should be 18.00/hr go for 13.oo/hr or less. Also lets start creating some jobs here eh? Ya ya I know big deal coming in with Samsung… but when exactly do they start working so that people can earn a living. Frustration is on medium right now dear city, but I’m sure that it will be full force if I don’t get a job by the end of summer. Just to warn you. I get that things in Windsor haven’t been all that great the last (let’s go with) decade. But it is so annoying and frustrating to see what is being offered for salaries and what they want for experience. Ok enough about that now. The other day I went to the States to go shopping. Oh Target how I love thee. I bought Isabella some sunscreen by California Baby and I really like how it works. So I decided to go back and get the sunscreen stick to make it easier to put it on her face. The sunscreen is all natural and organic and the best part in my opinion is that the lotion isn’t absorbed in to the skin. Instead it sits on top of the skin and acts like a mirror. It also doesn’t contain PABA which is used now shown to increase cancer. And with Isabella ultra sensitive skin, I like there is no fragrance or artificial chemicals. It is a bit pricy, 18.99 for the tube and 13.99 for the stick, but I have no problem paying that amount if it’s a healthier choice for her. Isabella an outdoor kid, so I need a good, safe, non toxic sunscreen for her. A great website to see what the environmental rating is for products is at the Environmental Working Group. This site rates product on how dangerous it is for you to use. This sunscreen for example is only listed at 1 being low. So now I use the website to find check all her products I use on her… and for myself. In other news… it is raining… and raining… and raining… I left a country because of the rain (well not just the rain but we’ll go with that). I think this Saturday is supposed to be nice but who knows. I’m hoping that the above pans out for the week. I figure if I’m unemployed I might as well enjoy the nice weather with Isabella at the park. The kid can just go for ever, watching her tires me out! Other than that, it’s been pretty darn boring around these parts. I either need a job.. or a vacation 🙂 OH wait, I need money for a vacation. Crap. For those who love and miss my dog (ie: Saxco Employees) Stoney is doing great. He loves it at my dad’s and spending time in Windsor or Up North. He just recently had 3 teeth pulled. His one tooth was really bad, it had abscessed. So out they came and now he’s an even happier puppy. He really tolerates Isabella, of course he is an affection hog so anyone who is willing to pet him, he’s game. His brother Rocky also tolerates Bug, but you can almost read his mind. “Please get this kid off of me, please make her stop” yet he just sits there and takes it. I’m hoping for a little more excitement in the next few weeks. Nothing MASSIVE, just a little umph. So either I get a job, or a unicorn falls from the sky giving me 3 wishes. I’ll take either one. This entry was posted in Family, Holidays, Isabella, Jobs, Rant, Uncategorized and tagged Family, Isabella, Jobs, life, Work. Bookmark the permalink. Good luck on the job search. That must be incredibly frustrating for you! Ya the job hunt is getting annoying tbh. I need to win the lotto!! LOL! !